This week I’m celebrating the work of Pupil Library Assistants, and also Shakespeare Week. I am a member of the judging panel for the Pupil Library Assistant of the Year Award. The competition for the prize was very fierce and, sadly, not everyone could make it to the final seven. However, these pupils clearly all had a great passion for books and reading and took this beyond the walls of their schools. Almost all of the pupils not only worked in their school libraries, but they had also had the opportunity to take part in other schemes connected to books and literacy. One of the longlist nominees, Miranda, described a little about her volunteer work at the Shakespeare Birthplace Trust. I was so intrigued by this that I invited her to write a blog post in more detail so that she could explain what Shakespeare and the Birthplace Trust means to her and other pupils. This is published here to take a closer look at the Birthplace Trust, and to encourage schools to sign up for Shakespeare Week. This runs from 16 -22 March 2015 and encourages everyone to take another look at the world’s most famous writer. So from a writer of the past…to a writer of the future! I’m lucky that I’m at a school where being a Pupil Librarian isn’t regarded as a bit bizarre. Everyone accepts my love of books (I was the first ever Year 7 to get the school’s Gold Reading Challenge Award) and, definitely, my admiration of the playwright, William Shakespeare. I was seven when I saw my first Shakespeare play (The Comedy of Errors) at the Royal Shakespeare Theatre in Stratford-upon-Avon. My mum explained that I wouldn’t understand every word of it, but that it wouldn’t matter. She was right – and had to shush me as I was laughing so loudly at the almost-pantomime on stage. No-one should think Shakespeare is incomprehensible, scary or “not for them”. Thanks to our School Librarian, Mrs Beeson, I was invited, with the other Pupil Library Assistants, on a behind-the-scenes tour of the Shakespeare Birthplace archives and instantly felt that it was the most amazing place. Since then, I have completed a week of formal Work Experience with the SBT and two weeks with them as a volunteer. I’ve already arranged to go back! I’ve helped with conservation work in the archives and at the Shakespeare Houses (having also volunteered with the National Trust for four years, my conservation cleaning experience came in very handy). 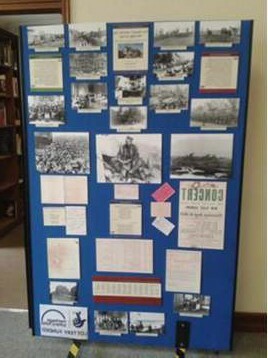 I learned how to use the SBT’s unique library system to carry out research, and this enabled me to create a display for the Public Reading Room. I should also say that the SBT archives are vast – and aren’t just about Shakespeare. They have masses of information on the local area and my display was on the arrival of Belgian refugees in Stratford at the start of WWI. I’m looking very carefully at the Wolf Hall adaptation on television at the moment, having spent time as a costumed interpreter at Mary Arden’s Farm, one of the Shakespeare Houses. Here, I dressed and behaved as a Tudor, helping to prepare authentic meals to eat in front of the public and discovering the customs of the time (for example, napkins are draped over the left shoulder, those wearing red are ranked more highly than those in blue, and all meals are eaten only with your personal spoon). So far, it looks as though Mark Rylance and his colleagues have got it about right. 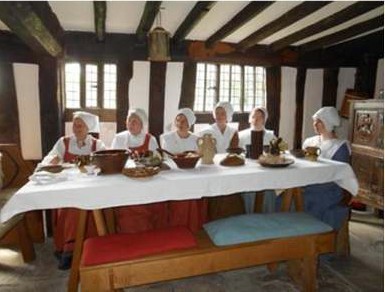 While immersed in Tudor life and language it was fascinating to see at first hand just how engaged visiting school children – also in SBT Tudor costumes – were by the whole experience and how much they learned from it. I think that Shakespeare Week is a fantastic initiative, and I only wish that I could have participated back when I was at primary school. If I could say one thing to all the pupils and teachers involved, it would have to be “don’t be scared of Shakespeare – he tells great stories”! You can find out a lot more about the Shakespeare Birthplace Trust using this link. Take part in Shakespeare Week too! Follow the link for more information and how to join in. The winner of the 2015 Pupil Library Assistant Award will be announced by 4pm on Thursday 12th March. 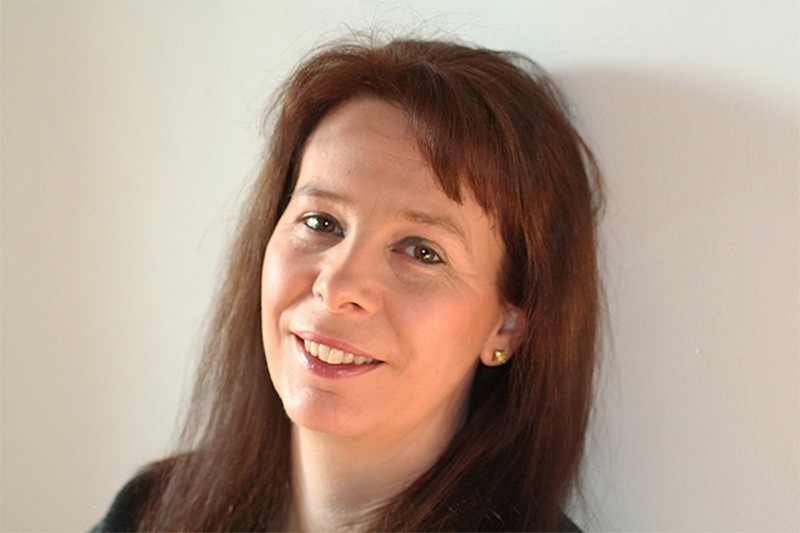 For this post we welcome aboard our Tardis YA author Helen Grant. Helen writes the most wonderfully scary and atmospheric books and her latest (Demons of Ghent) is due out today. It is the second book in her Forbidden Spaces trilogy, the first being Silent Saturday, and the latest in a rake of fabulously scary books. I am a great fan of Helen’s work and so am thrilled to read her choice for a Tardis Destination, and a tale of a delicious mystery…. over to Helen! If I had a Tardis, I know exactly when and where I would go: the city of Ghent in Flanders (the Dutch-speaking part of Belgium), 1426. 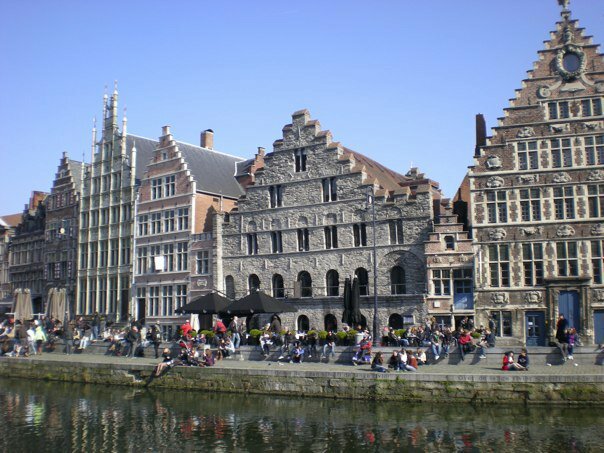 Although I spent every summer in Belgium as a teenager, I never visited Ghent until 2011, when we were living in Flanders. I fell in love with the city instantly. It has such a strong sense of times past: there are many beautiful old guild houses, magnificent churches and even castles. 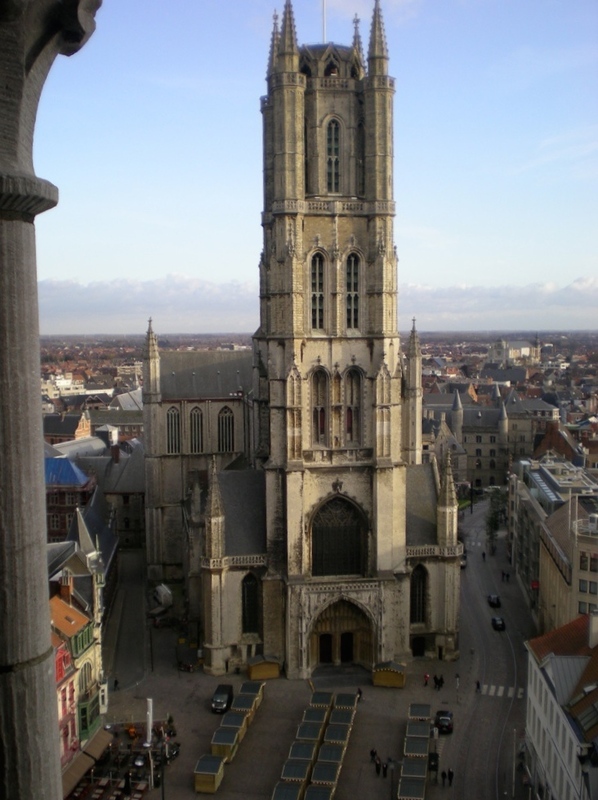 If you stand at the top of the keep of the Gravensteen castle, you can see the three famous towers of Sint-Baafs cathedral, the Sint-Niklaaskerk and the Belfort (city belfry). It’s amazing to think that if you had stood there five centuries ago, you would have been able to see that same view. Ghent is also intersected with canals. There is one particularly beautiful waterfront area called the Graslei where the gorgeous old buildings are reflected in the glossy water. Altogether, it is an enchanting city. When we visited it in 2011 I was working on the first of three books set in Flanders, and I decided there and then to set the second one in Ghent. It is hard to write convincingly about a place when you have only spent four hours there, so I went back for a week in December 2012, and spent days walking about, taking photographs, writing notes and asking questions. I loved everything I visited in Ghent, but the place that spoke to me most of all was Sint-Baafs Cathedral. Built in the 14th-16th centuries, it is a massive Gothic church with a huge square tower, a vaulted crypt and lots of interesting side chapels. Best of it, it houses the Ghent Altarpiece, the enormous panelled painting sometimes called ˝The Adoration of the Mystic Lamb.“ It was largely this painting that convinced me that I wanted to set a book in Ghent, and indeed it features in my new thriller Demons of Ghent. I’d like to go back to Ghent in 1426 because I would love to satisfy my absolutely raging curiosity about the Ghent Altarpiece! There are so many unanswered questions about it. It is described as being by ˝Van Eyck“ but there were two Van Eyck brothers, Hubert and Jan, and nobody seems to know for certain who contributed what to its creation. Hubert Van Eyck was the elder brother and he is thought to have been commissioned to create the Altarpiece around 1420. However, he died in 1426 and the work was apparently taken over by his younger brother, Jan. It was evidently completed by 1432 because that year it was installed in the Vijdt chapel in Sint-Baafs. Over the years there have been many theories about who was responsible for what part of the painting. It has been made much harder by the fact that there is virtually no other surviving work by Hubert for comparison. He is thought to have started a painting called The Three Marys at the Tomb but someone else finished it – perhaps Jan. There is a latin verse on the painting’s frame that praises Hubert and describes Jan as ˝second in art“, but this might be a piece of brotherly generosity. In the past, Hubert’s very existence has actually been questioned, because of the lack of evidence of his work. There is also a weird story that Hubert Van Eyck’s right arm – presumably his painting arm – was cut off after his death and preserved in a casket over the cathedral door. The rest of him is buried somewhere else in the cathedral. How strange is that?! I think writers, with our overactive imaginations, make great conspiracy theorists. I heard all of these disparate details – the confusion over who painted what, the death of Hubert before the painting was finished, the severed arm thing – and some truly wild explanations suggested themselves to me. Some of those ideas became the backdrop to Demons of Ghent. I’d love to travel back to 1426, just before Hubert Van Eyck died, and see what was happening. Did Hubert hand over the brushes and the pots of oil paint to Jan when 95% of the painting was finished, or did he leave his younger brother with little more than sketches? If I could ask Hubert about the rest of his now vanished oeuvre, what would he tell me – perhaps even show me? Did his contemporaries really think that Hubert was the greatest and Jan was second best – or was that a piece of humblebragging from Jan? Did they really cut Hubert’s arm off his cooling corpse and stick it in a box over the door, like a particularly grotesque bit of interior decor? That’s the main reason I’d go back, to find out what really happened. But there’s one other thing about the Ghent Altarpiece that fascinates me. 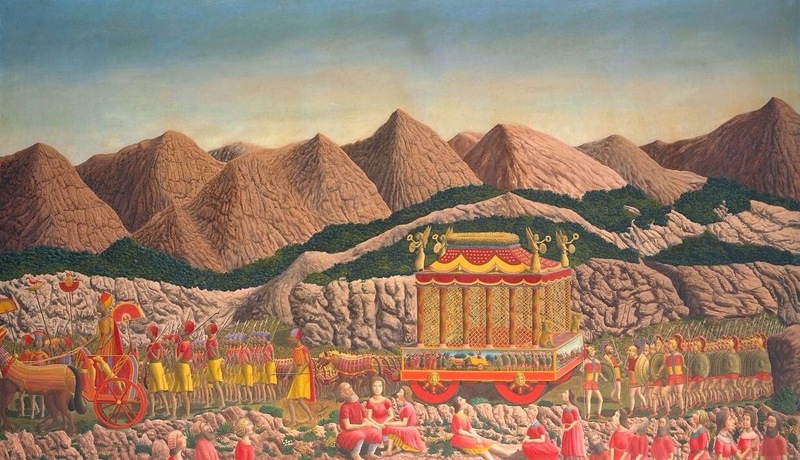 The central focus of the painting is the Mystic Lamb on its red-and-gold altar. On either side of it are crowds of saints, prophets, pilgrims, hermits and so on. In total the painting has 170 figures gazing into the central panel at the Lamb, or casting their eyes down, sometimes to read holy books. Amongst the red-robed clerics at on the right, a single bishop stares out of the painting at the viewer, his head inclined, a challenging expression in his eyes. When I first noticed this figure, I found him distinctly creepy. Are we, the viewers, meant to notice him? Why does he, alone, attempt to connect with us? Is there some significance to his challenging gaze? I’ve often wondered – all the figures must have had models, so was there something special about that one? Did Hubert, for example, put himself into the painting? Since the only portrait of Hubert I’ve been able to find was a woodcut made long after his death, there is no way to know now. Unless….I had a Tardis. http://closertovaneyck.kikirpa.be A website showing the Ghent Altarpiece, with the ability to zoom in on any part of it. 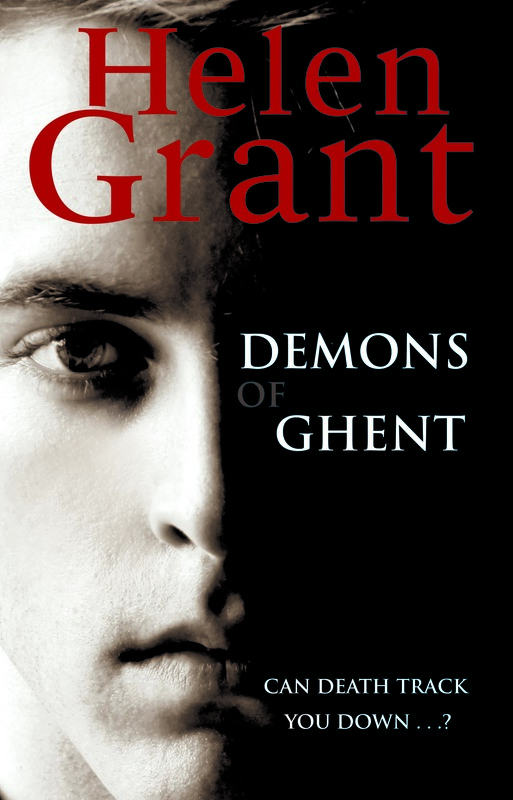 http://www.randomhouse.co.uk/editions/the-demons-of-ghent-forbidden-spaces-trilogy-book-two/9780552566766 Random House website entry for Demons of Ghent, including click function to read a sample of the book. Shakespeare is not the only bookstore – Part One.